During the past decade Latin America has become a scene of hope and expectations as its leaders and social movements have raised the banner of twenty-first century socialism in a world ravished by imperial adventures and economic disasters. Proponents of the new socialism assert that it will break with the state-centered socialism of the last century, and will be driven by grassroots social movements that construct an alternative order from the bottom up. There is also widespread concurrence that the process will take a unique path in each country, that there is no single model or grand strategy to pursue. 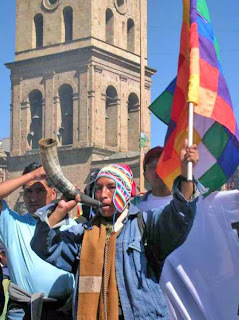 In Bolivia, the struggle for a constitutional assembly and a new constitution was particularly strife-ridden as the oligarchy, centered in the resource-rich lowland area of the country, engaged in an outright rebellion with the tacital backing of the U.S. Embassy. Little was heard of socialism in this period, in spite of the name of Morales’s political party, Movement Towards Socialism (MAS). From an ecological perspective, others like Marco Ribera Arismendi proclaim: "We have changed the discourse, but not the model.” A member of the Environment Defense League, one of Bolivia´s largest environment organizations, Ribera adds, "We had great hopes in this government to solve or make a change on these issues," but it has instead followed an extractive industry model that is driven by transnational capital. While it is true that Morales has not launched a full assault on capital, his government, along with the other new left governments in Latin America, have ended the neoliberal era in which the International Monetary Fund and the World Bank imposed free market policies, severely curtailing social spending, and enabling transnational corporations to gain unprecedented control of the region’s nonrenewable resources. Now, many of these governments are using the state to exert greater control of the economy, and are renegotiating the terms of investment in order to capture a greater portion of the revenue for social programs and to facilitate internal development and industrialization. The process of transforming Bolivia’s social and economic institutions will be the task of the legislative branch, which will be drafting more than100 bills to implement the provisions of the country’s new plurinational constitution. Of central importance is the empowerment of the indigenous communities, and granting them the economic resources to construct communitarian socialism. The existing agrarian reform law will be revisited. According to Victor Camacho, the Vice-Minister of Land Issues, “we are going to re-territorialize the indigenous communities,” recognizing that the ancestral communal lands have been seized from the indigenous peoples since the conquest. Roger Burbach is director of the Center for the Study of the Americas (CENSA) and a frequent contributor to NACLA, where this is republished from.